As the expansion of Estadio Benito Villamarín progresses, fans are in for a big surprise in the 2017/18 La Liga. 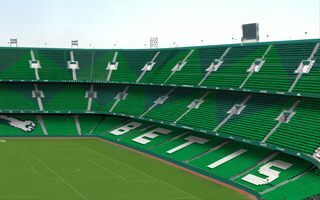 To prepare them for the changes, Betis already presents future layout of the stadium. As we’ve informed you, this past summer Real Betis torn down the old south stand in order to replace the single-tier structure with a much greater one. Thanks to this change capacity will exceed 60,000 seats and make Betis’ stadium the fourth largest in Spain. Unofficially this is part of local rivalry with Sevilla, who are also running a stadium upgrade project. But surely it’s a wider race among biggest Spanish clubs to boost their stadium revenue. After Athletic, now Atletico are close to delivering their new stadium, while Real, Barca and Valencia all have plans awaiting implementation. No wonder that the 2017/18 season should bring additional revenue to Betis. Single-match tickets alone should bring additional €1 million, especially for the four big La Liga games against Sevilla, Barca, Real and Atletico. Season ticket sale for the new south stand is estimated to reach €1.5 million per year and improved image of the building should increase TV revenue by further €500,000. This doesn’t include increased chances of holding additional events, like games of the national team.